During the development of applications, you would commonly want to investigate which parts of code are taking the longest to execute. You can perform such an investigation by running the Profiler on an executing application to quickly generate a report on the most frequently called functions in the running application, tasks in the application that are taking more time than expected and which functions are taking the most time in the application. In Profiling the behavior of an application that is configured to be debugged in the Execution Analyzer, you can monitor calls in the application. Profiles can be recorded by executing an existing Analysis script that typically defines the application to build, test and debug, and any sequence recording options, or attaching to a running process. The second option is useful if the application being analyzed spawns from a call from another application (such as Winword.exe), Is running as a Service, or Is best monitored at a known point of processing (such as after a user interaction). The Profiler reports can be stored as external binary or .xml files, which you can re-load at a later time, or internal documents attached to Artifact elements or Team Review posts, to distribute to team members. 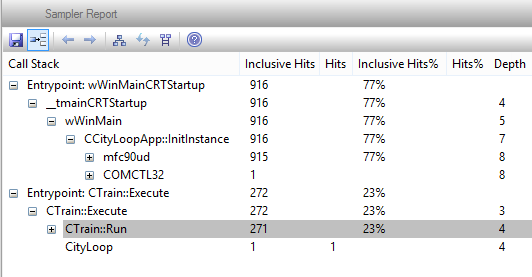 The Profiler supports analysis of applications built on C, C++, Visual Basic, Microsoft .NET and Java platforms, each of which has certain pre-requisites. When the Profiler is launched during the execution of a script, it creates a Profiler process that collects samples at regular intervals from the stacks of each thread in the target application process. 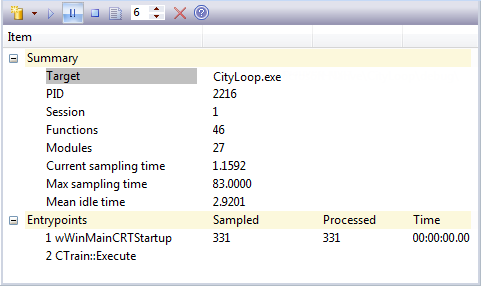 The Profiler window displays the status details of the Profiler process as it executes. You have a number of toolbar options for starting the Profiler process, modifying its action, and pausing or stopping the process. The Profiler generates a report in the Call Stack, which shows how the application functions are called in relation to the application; for example, how one function might be taking most of the overall time recorded, and how that is caused by some of the sub-functions that it calls.